Yesterday morning, I suited up in my gear, grabbed my sneakers and a pair of socks and headed off to the local running specialty store for a gait analysis and fitting. Confession. I was terrified and intimidated and absolutely certain that I was in over my head. But I wasn’t going to let my lack of confidence stop me from dealing with what could potentially be a problem in my continued training. I was there when the doors opened, and was glad to be the only customer in need of a fitting. My sales rep was incredible. I knew we were going to hit it off the minute she turned on some Maroon 5 for background music. That helped me settle right in. The advice given to me by running friends was to be absolutely honest and descriptive about my issues and concerns. And I was. Before we got started, I explained about where I was in Couch 2 5K, what my long term goals were, and what has been going on with my feet and ankles. S listened to every word I said and checked the fit of my Nikes. She told me that some problems were going to be caused by the fact that I bought shoes true to size (aka too small in the running world), and that I was wearing cotton socks (which absorb sweat and are not conducive to running). The rest would probably be sorted out by the actual form of my feet and the way I run. I stood on a sensor pad that measured my feet, the way I stand and how I distribute my weight. The first thing S said to me was that I have “insanely high arches.” On the plus side, I am pretty close to maintaining a perfect center of gravity (I lean just slightly to the right, which might account for why I feel the discomfort more in my right foot), and I carry the bulk of my weight in my heels, which is where it should be. So at least I’m doing something right. She then sized my feet, gave me a “neutral” pair of shoes to try and we moved on to the treadmill. At this point, I probably broke into a sweat, because the treadmill and I are not friends. S started me off at a walking pace, while videoing my feet from behind. She said she could see some of the problem, so I asked her to increase the pace so I could (try to) run and she could maybe get the full picture. After all, if I’m investing in the shoes, I want them to address all my issues. The end verdict was pronation, caused mostly by my arches. I’m rotating my ankles inwards to compensate for the lack of support on my instep. S said that we would find shoes that would correct the issue on the road. All in all, I tried on five pairs. I could have stayed all day if I wanted to or needed to. I was S’ top priority and the goal was to get me shoes (and socks) that would work for me. We started with a pair of New Balance and then some Asics. From there we tried Brooks and then we went to Mizunos. All were slightly larger than my real size to allow for swelling of the feet and all offered different levels of support and comfort. I was encouraged to leave the store and run around the parking lot of the strip mall for each pair. (It was pretty hilarious, passing by the shoppers, and I tried to stick to a kind of quiet area of the shopping center for some privacy. I’m funny that way.) Even for the shoes that weren’t exactly right, I noticed such an immediate difference in cushion and in the way I was hitting the ground. It’s just insane that a shoe could make that much difference. I was torn between the Mizuno Wave Inspire and the Brooks Ravenna, so S told me to put on one of each and run it out. The Brooks were soft and cushiony, which I really liked, but the Mizunos just felt more firm and structured. Like they were holding my feet together. For short-term, the Ravenna’s would be nice, but I was worried that over miles, they would start to feel sloppy and sloggy, whereas the Mizunos might be more firm and supportive. I could be wrong, but this is what my gut was telling me. But wait. There’s more. The Mizunos were available in the blue/pink combo that I first tried, but also and orange/red variety. I tried on the orange, and actually found the fit a little different. If not better. 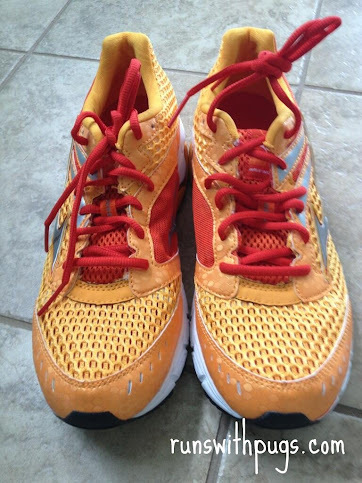 So I ran with those and even though I really think I preferred the look of the blue, my feet wanted the orange. And here they are. They’re pretty different and awesome and I can’t wait to give them a test drive on Week 7 Day 2. The final hurdle was socks. And I was honest about that, too. I hate socks. I don’t care about them. I own approximately three pairs, all of which were purchased for running, and one of which I can’t even find right now. As long as they were no-to-little-show and white on top, I didn’t care what they looked like. S picked out a three-pack of appropriate socks for me, and she did really try to convince me to be excited, but I just didn’t have it in me. I took the advice (and the socks), though. I was absolutely blown away by the one-on-one attention, the time S was happily willing to spend, and all the advice and interest in finding me the right shoes so I can continue my training without risking injury and without losing my developing enjoyment. Once I got settled, my nervousness and self-consciousness really melted away – there was clearly no reason for it to begin with. I never once felt like I didn’t belong or that I wasn’t good enough or serious enough to benefit from S’ expertise (and she had a lot to share). Of course, these shoes still have to go the distance, literally. I will certainly be reporting back on how they do. The good news is that if I have any problems with them in the next 30 days, I can return them for something better suited to me. Stay tuned for the grand conclusion! Sounds like a great experience. I am tempted to do this myself but cost is holding me back. I have compression socks that worked for my numbness and tingling so far and my shoe size is not true to size so I’m doing something right. I hope they make c25k a better experience so you can kill that 5k coming up! You know, they really weren’t that bad. I was expecting several hundreds which is what scared me off the first time, but I walked out of the store under $150 and I was pretty impressed by that. I think about my bad knee (which is not bothering me) and how expensive an injury could be down the line (both monetarily and physically) and it makes it worth at least going in to see what they have to say. Is it money I would rather have spent on a camera lens or a night out? Kind of. But I have some big races coming up and I need to give my body all the help it can get. I can’t wait to hear how your first run in your pretty new shoes goes! Non-cotton socks make a huge difference too – I cannot run in cotton socks anymore. My favorites are my balegas. And I’m sorry. I don’t get the sock love. I wore the new ones out today and … I mean. They’re socks. They didn’t annoy me and they didn’t hamper me. I’m going with neutral reaction for now. But again, I despise socks and the only time I wear them is for running or if I’m traveling up north in winter (at which point, I actually have to buy socks because I don’t have any). I’m totally in love with my Feetures. I never cared much about socks and wore the sport ones from Target for the longest time, but once I started running over 5-6 miles, I realized I needed better socks. Now I can’t imagine not wearing them. Everyone has things that make or break their runs. I’m glad you found a pair of shoes you love! Can’t wait to hear how you like them. I’m getting fitted for a new pair this weekend (I use an old model Brooks that aren’t around anymore and it’s time to stop hoarding them from Ebay and get ones I don’t have to track down).